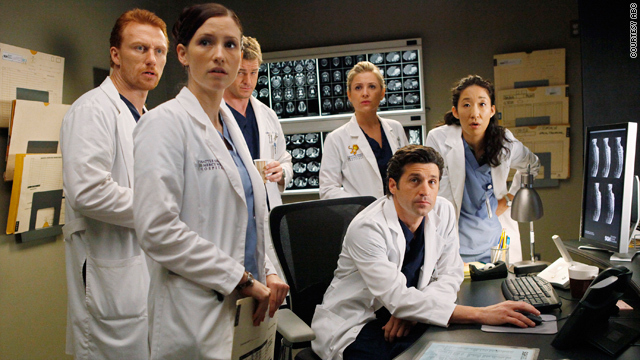 The treatments doctors deliver on shows such as "Grey's Anatomy" may not always correspond to reality. The findings are not surprising to Dr. Lisa Sanders, technical adviser to "House, M.D." (CNN) -- When your favorite hospital drama star is treating a patient who's having seizures, you might want to pay more attention to what's revealed about the doctor's personal life than what he or she is actually doing. It turns out that popular medical dramas don't always portray medical treatment accurately. A new study found that seizure care in particular was depicted appropriately less than half the time on major fictional medical shows. "People who are watching these television shows and don't know how to respond might get the false impression of how to provide first aid, and, when they're trying to help someone having a seizure, actually do some harm to them by stuff they learned on television," said researcher Andrew Moeller of Dalhousie University in Halifax, Nova Scotia. In nearly 46 percent of seizure cases, characters on these shows delivered inappropriate treatments such as holding the person down, trying to stop involuntary movements or putting something in the person's mouth, the study said. The shows did show proper treatment about 29 percent of the time, and in the remaining 25 percent of the time, the accuracy of the portrayal couldn't be determined. Proper care for seizing patients is to clear the area of dangerous objects, put something soft under the head, rotate them onto their side, make sure they don't hurt themselves while convulsing, and provide support by just being with them until they return to consciousness, Moeller said. Do not stick something in the patient's mouth, he said. First aid for seizures was provided by "nurses" or "doctors" in nearly all of the televised cases, he said. Viewers may be more likely to believe that the kind of treatment they're seeing is real if doctors, rather than nonmedical characters, are performing it, he said. The researchers have not yet broken down which shows were better or worse at depicting seizure first aid, he said. The findings are not surprising to Dr. Lisa Sanders, technical adviser to "House, M.D." and author of "Every Patient Tells a Story." Her New York Times Magazine column "Diagnosis" was one of the inspirations for the show. "It's very clear to anybody who watches 'House' and has ever been in a hospital that 'House' is not a close representation of the truth on any level," said Sanders, an internist on the faculty of the Yale University School of Medicine. The accuracy of medical treatments on "House, M.D." have gotten better over time, however, she said. Sanders recalls spending nearly an entire season persuading the "House" production team to not put anything in patients' mouths during seizures. Her advice triumphed during one episode when a doctor scolded another character who put something in a seizing person's mouth, explaining that it would choke the patient. "They're interested in representing the idea of the uncertainty of making the diagnosis and the likelihood of diagnostic error on the way to making a correct diagnosis," she said of the "House" team. "Everything else is completely subservient to the needs of the drama." Part of the reason that shows like "House" are far from true-to-life is that real medicine is supposed to be as undramatic as possible -- doctors perform procedures and try to make sure that no one gets excited, she said. On the show, which centers on Dr. Gregory House and his team of doctors, few nurses are portrayed, and hardly any technicians, transport people or other medical professionals are seen. House and company personally perform tests and procedures, including brain surgery, that other kinds of health care professionals would do in real hospitals, she said. Even more annoying to Sanders is when Dr. House performs surgery without a mask or hat. The "Sherlock Holmes" aspect of diagnostic medicine on "House" is real, however, and the description of the detective process in those mystery books reflects what real doctors do, she said. Sanders tries to read all of the show's scripts, and she'll send an e-mail with points she considers erroneous from a medical perspective. Sometimes the show will take her advice and fix the inaccuracies, and other times, they will remain in the final broadcast. False depictions of CPR are probably more alarming than misrepresented seizure care, Sanders said. Normally, seizure care is left to doctors, who don't get their information on treatments from television. But CPR is a procedure that lay people do learn how to do, and they might get false impressions from watching dramas, she said. Medicine today requires a collegial environment, with constant collaboration among technicians, radiologists, surgeons, doctors, nurses and other hospital professionals. That's why House's character -- crotchety, aggressive, egocentric and disrespectful of rules -- is somewhat unrealistic, she said. There are, of course, doctors with big egos, but getting along is important, she said. "We've all learned how to work together with our own and other people's enormous egos to serve patients' needs," Sanders said. "There might be doctors like House, there are not very many, and I would suspect that they're not nearly as successful."